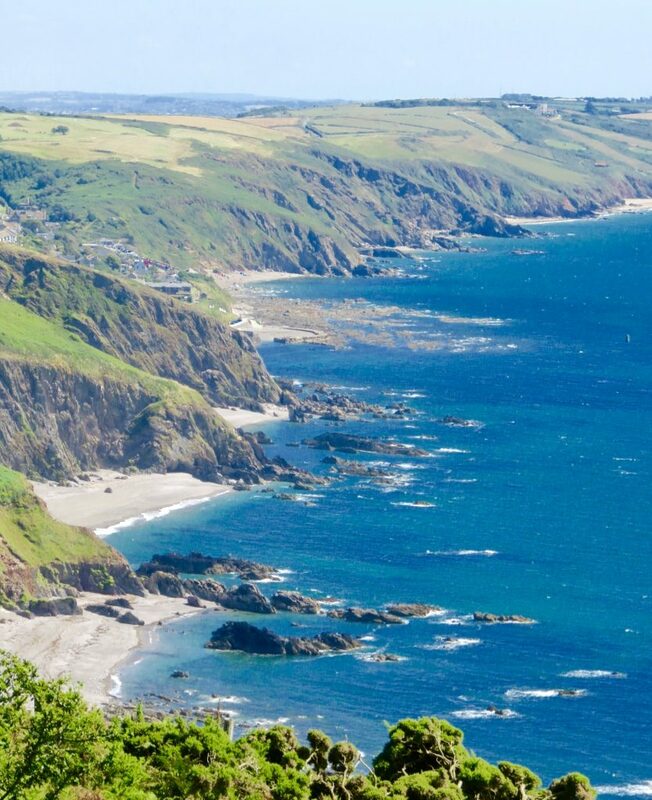 The South West Coast Path from Looe to Kingswear. 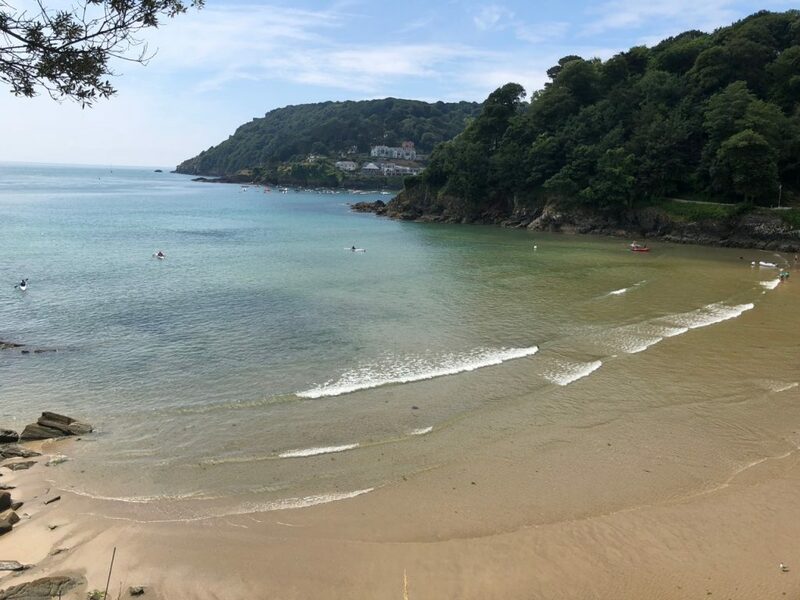 In his fifth blog on the epic South West Coast Path Richard Langley leaves Cornwall behind as he walks from Looe and heads for Kingswear in South Devon. What a day’s walking I had ahead of me on a stunning blue sky day. 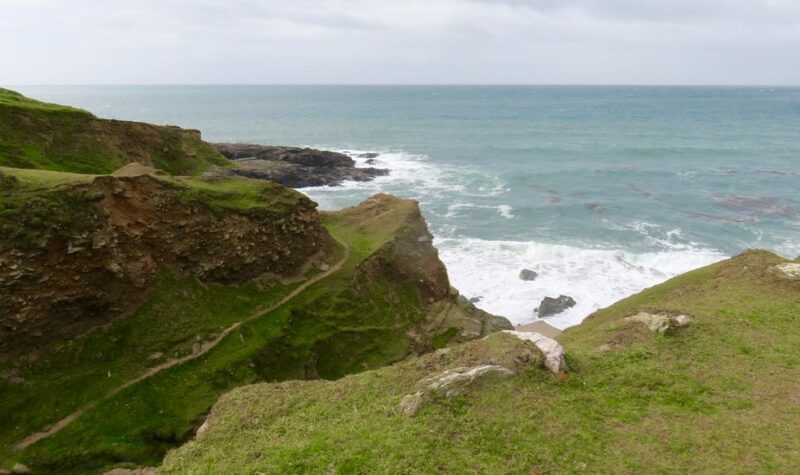 The section to Portwrinkle was tough with the highest cliffs on the Southern section negotiated either side of Downderry, Battern Cliffs 462 feet to the west and 500 ft to the east. for me after all those nights under canvas. 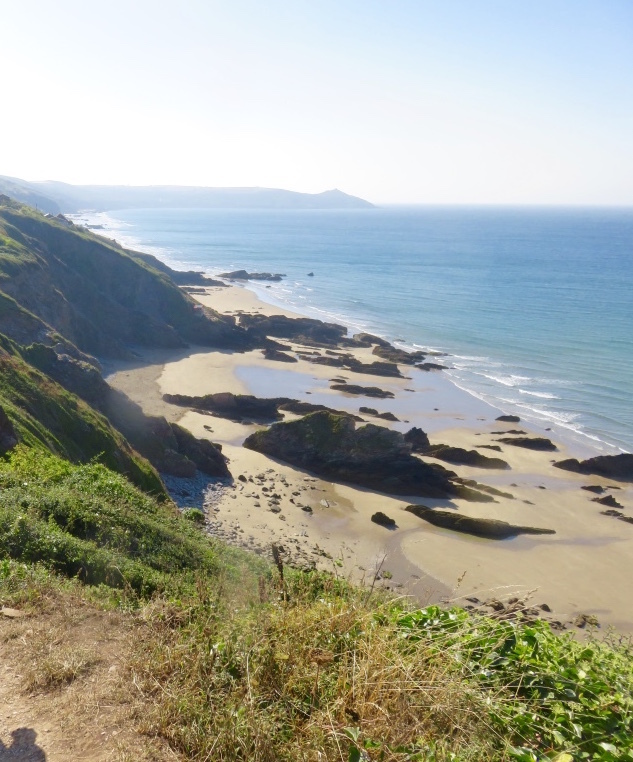 The next day brought more blue skies and a great walk above and along White Sand Bay to Rame Head where a medieval chapel embellished the grassy slopping headland. Then on from Rame Head to another prominent land mark, Penlee Point with its Trinity House Fog Signal station. You could just imagine those ‘thick as a bag’ fog banks down in the bay, yet today it was as clear as it could be. This section had the most amazing wild flowers, butterflies and hawks… the spectacular nature just keeps you going. 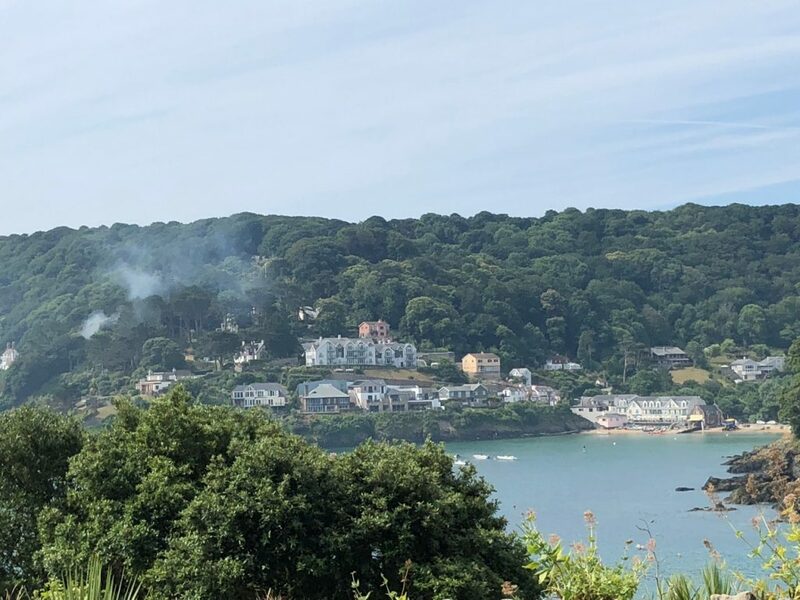 From Penlee on and down towards Cremyll and the ferry across the narrows and into Plymouth. 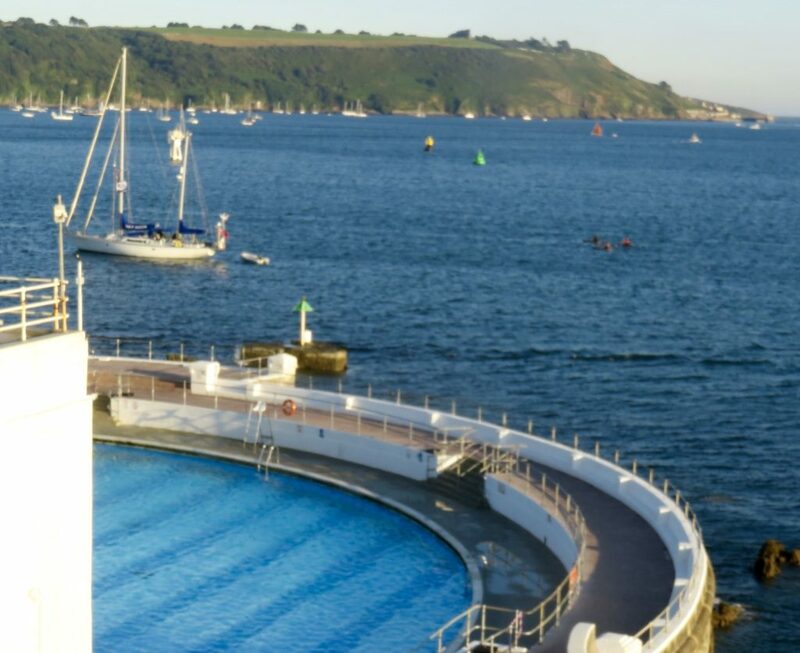 The walk around the edge of Plymouth was stunning. It was such a contrast from the cliffs and moors but so enjoyable. The history all around with the docks then down to the Hoe and the lighthouse was all amazing. Just to make things more interesting it was the night of the national fireworks competition. I got a ferry across the Sound to Mount Batten Point, then walked south up the hill and found myself amongst thousands of spectators there to witness the fireworks. It was a long walk back up to the top. There was an old camp site marked on the map but sadly nowhere to be found. I could see some caravans in the far distance with a pathway leading that way. It was miles away so I turned back…by this time it was approaching midnight, I had to circumnavigate some fields with bulls but finally got back to the road. Just before the road, on the edge of the ploughed field, there were several glow worms as if lighting the way. There was a distant light on at a farm house, with the farm dogs barking I knocked on the farmer’s door to enquire about camping the night. He said, ‘Fine, just pitch on the grassy drive way’. He added, ‘Don’t worry about the guard dogs… they’ll stop barking soon.’ Next morning I got a ‘knock’ on the tent flap and there was my morning cuppa. Then another, after I took down my tent. What hospitality…another example of how kind almost everyone had been. Refreshed with all that tea and having recovered, the next target ,via Wembury Bay ,was the River Yealm and the ferry crossing to Newton Ferrers. 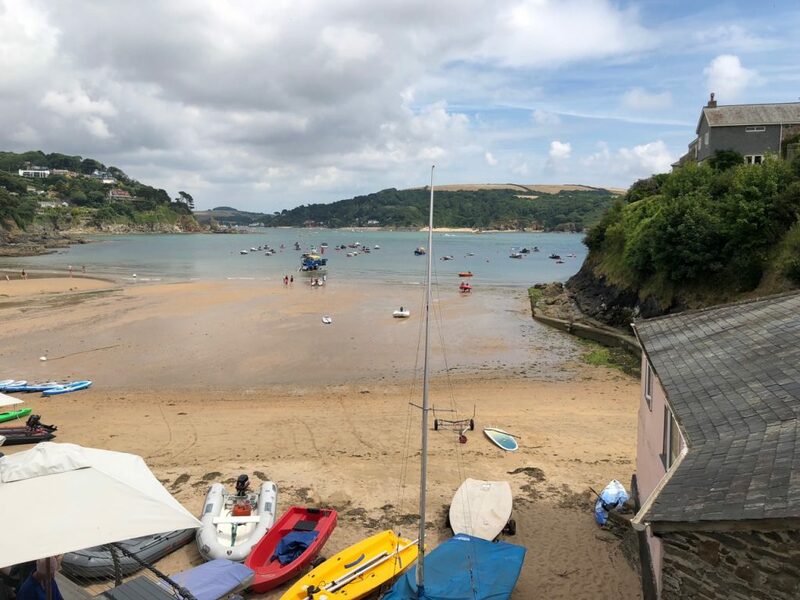 Sadly the ferries had gone when I got there so it meant hailing a taxi up to Yealmpton, then pitching up for a night at the community camp site. The next day I picked the path up again the with the same taxi driver to start the next section. It was a shame the ferries were not more regular but I had to stop and camp somewhere, so the taxi was very helpful. Bigbury was the next target and the river crossing over the Avon and Bantham on the other side. 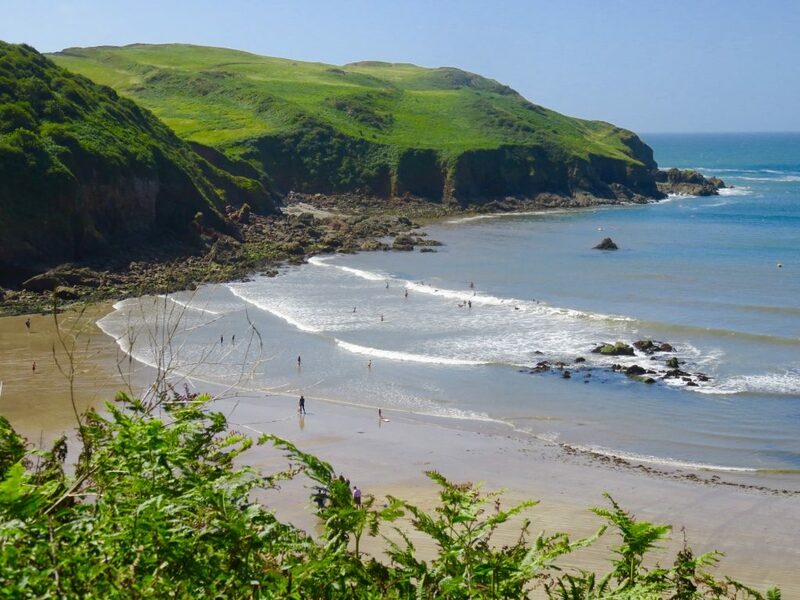 Bigbury has the most spectacular beach with Burgh Island adding much to the scenery, as you look down from the approaching cliffs. After a wild camp near the Avon I needed an early ferry to get across. To alert the ferryman you just needed to wave and hail from the waterfront and, hey presto, the ferry appears. 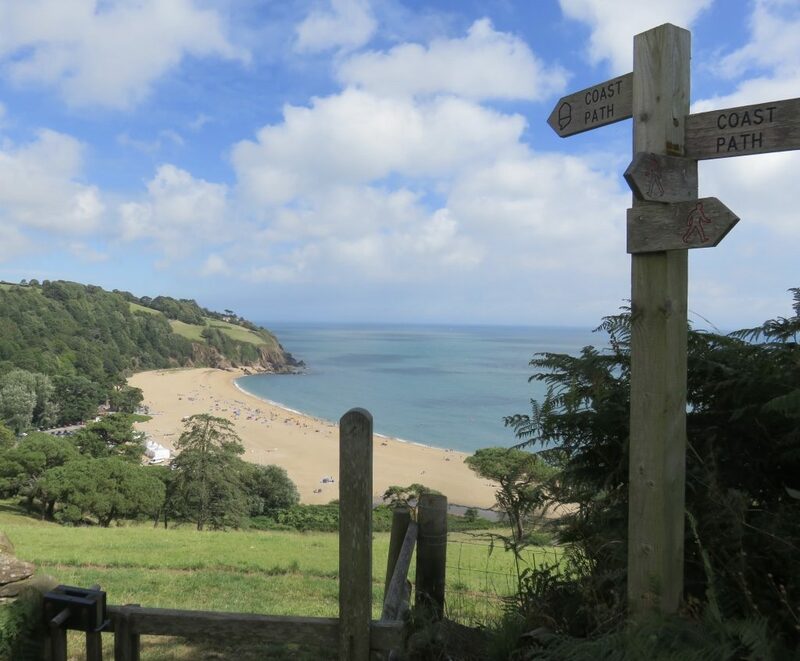 The walk from Bentham and on to Salcombe is one of the most spectacular. 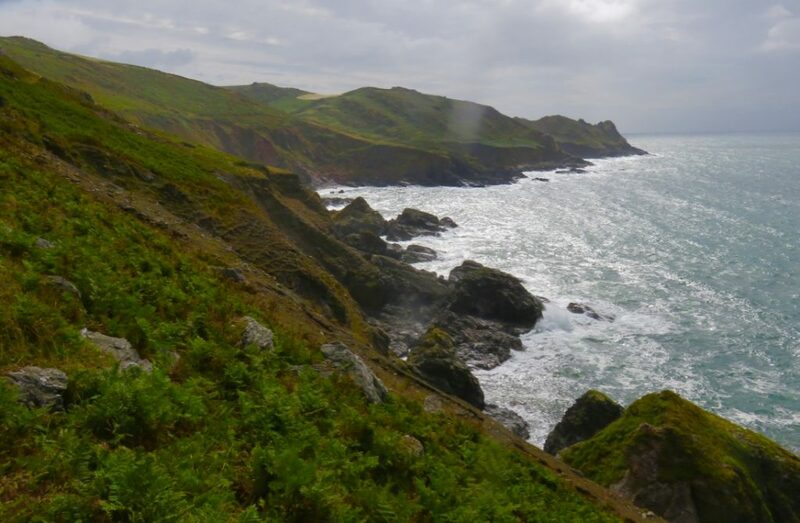 With high cliffs and deserted sandy coves below, the headlands to the west Bolt Tail, and Bolt Head to the East give spectacular views out to sea. The weather was about to turn from balmy warmth to severe gales and torrential rain as a big storm approached. 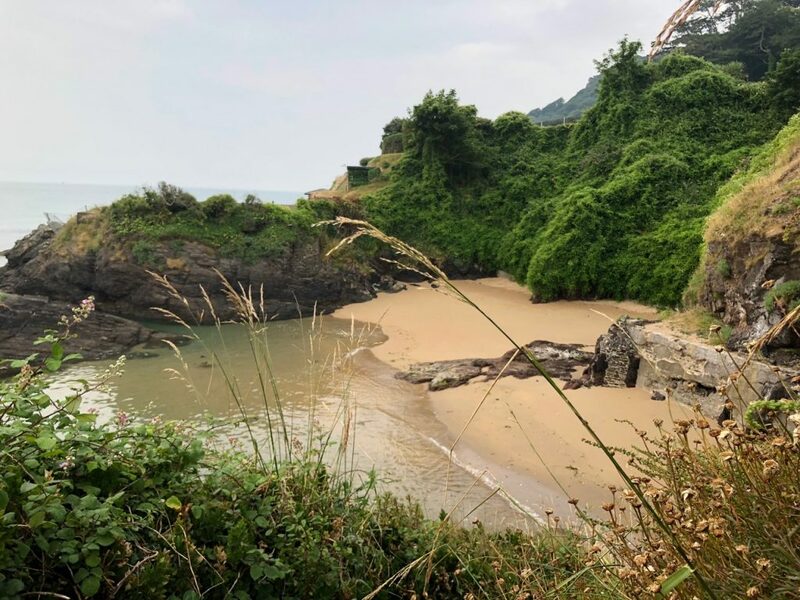 I got lucky and found a B & B in Salcombe and sheltered there and took a rest day, giving me time for a freshen-up and time to soak in a bath and replenish with some essential new clothing! With a laundrette in the town it was good to get ready for a fresh new start the following day. 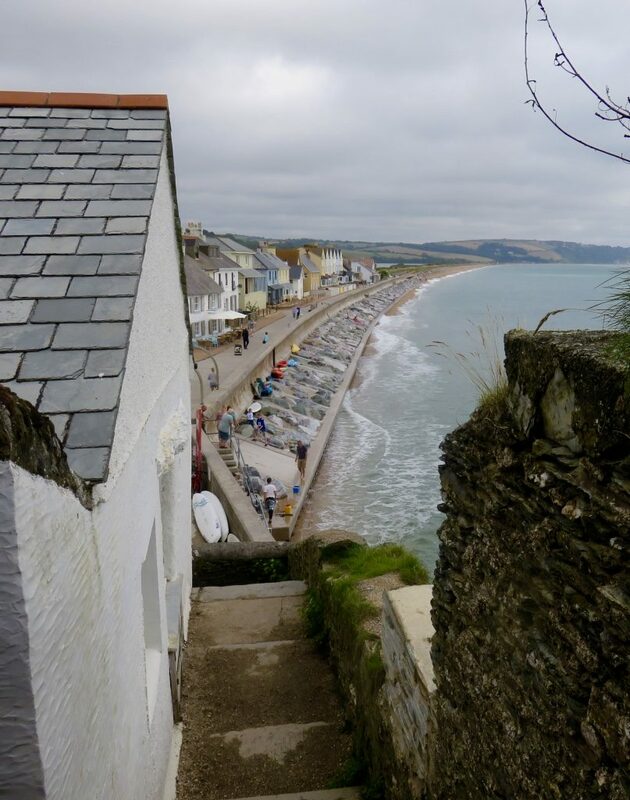 Next day after taking the ferry over to East Portlemouth, the plan was to get as far as Beesands by late afternoon. 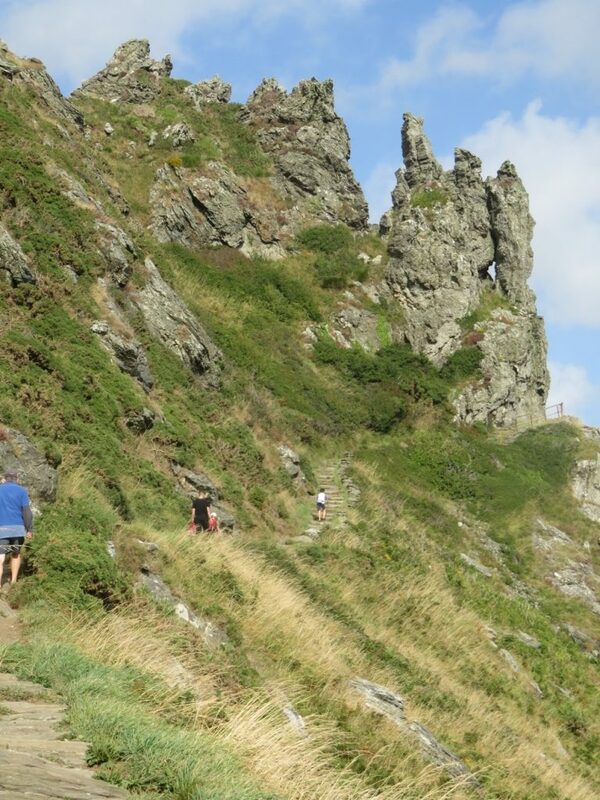 This was a superb section going on to the Light House at Start Point and then along the raised beach below East Prawle. Approaching Torcross there were many signs inviting walkers to Beesands Chapel for free tea and cakes. 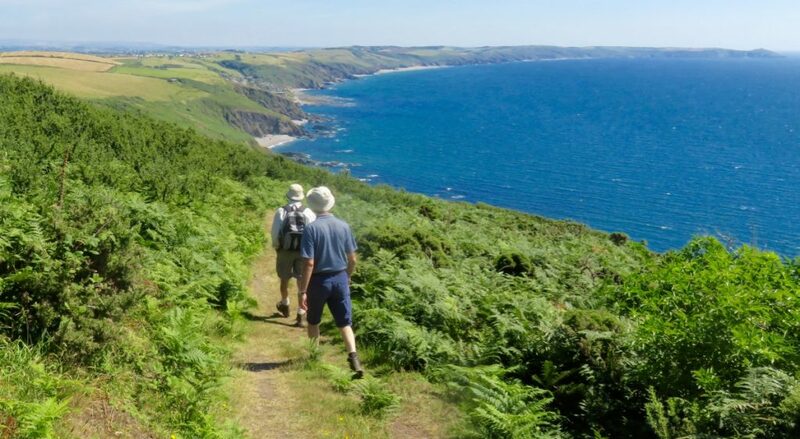 I got there to find a hall full of walkers with tea, coffee and a splendid range of cakes and even cream teas on the menu. All this was provided by the chapel volunteers who asked for donations for the church fund in return. Apparently, the Church has opened for this charity day over many years and tens of thousands have been raised to keep the church maintained in face of the severe storms that often batter the coast here. This was a wonderful encounter and the ladies told me of a camp site up on the hill. Sure enough, it was a great site with clean toilets and an honesty box for payment. 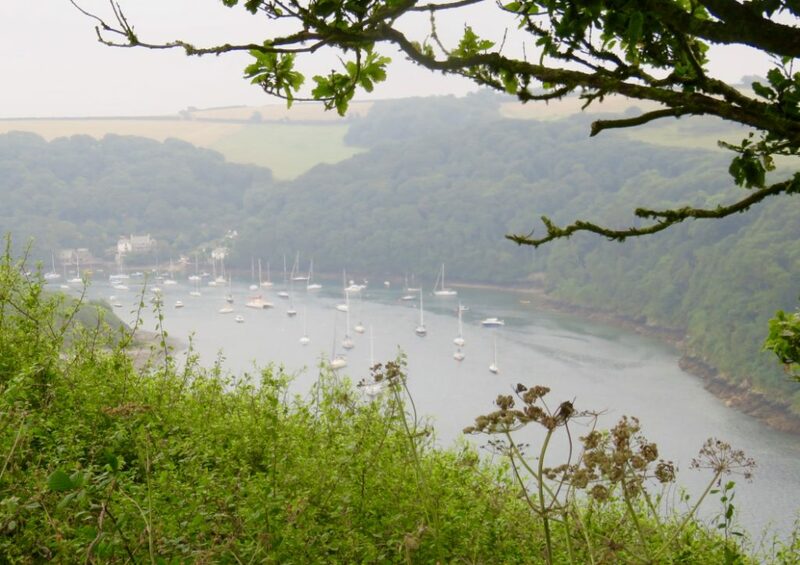 The next day, feeling very refreshed and inspired with the local generosity, I set out for Dartmouth and Kingswear. Going over the tops after Slapton then down to Blackpool Sands, the view was perhaps the best of the whole walk. It was a long trek into Dartmouth and then across the Dart to Kingswear. I got a great, late meal at the Ship Inn, and enquired about a camp site anywhere nearby. They told me there was one at the top of the hill. I got there at 10.30ish and with no one around proceeded to pitch up in the tent field of a most pristine site with the intention to paying before leaving the next day. I just got the fly sheet up when I was accosted by the site owner who tried to throw me off the site, ‘Don’t want your types here’ he said ,’ you pitch up late then bugger off without paying’. Although incensed I calmed him down and said I would pay the next morning. After all, I was exhausted and couldn’t have run even if I wanted to. This was the one and only disappointing encounter I had on the whole walk. I did not dwell on it. 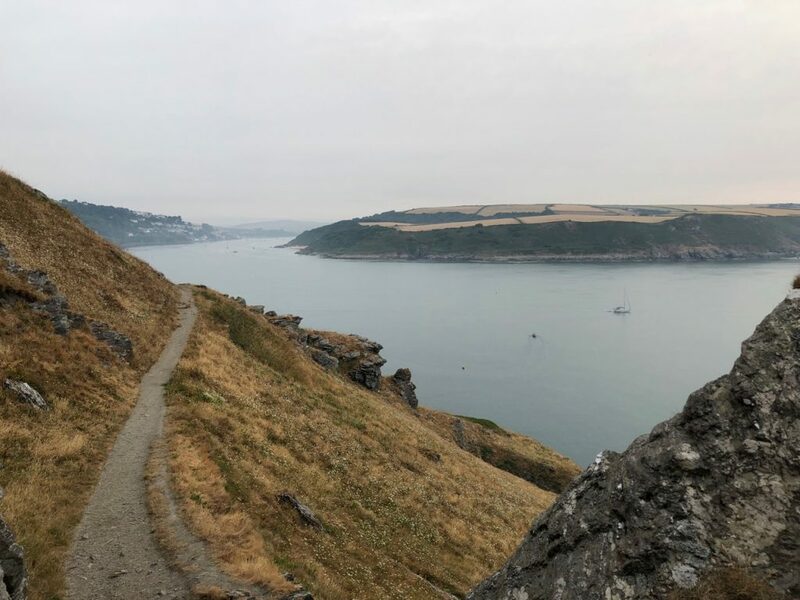 I soon fell fast asleep, getting the rest I needed for the final phase of the walk – through to the finish at Poole Harbour – which I was to begin the following day.